The City of Omaha officials unveiled the new improvements to the Northeast Street Maintenance Facility on Wednesday, April 20, 2016. Schemmer's Terry Wood, AIA, LEED AP, Project Manager and Architect and Mike Fortenbury, Construction Contract Administrator attended the ribbon cutting ceremony for the $5.25 million project located at 18th and Jaynes Streets. 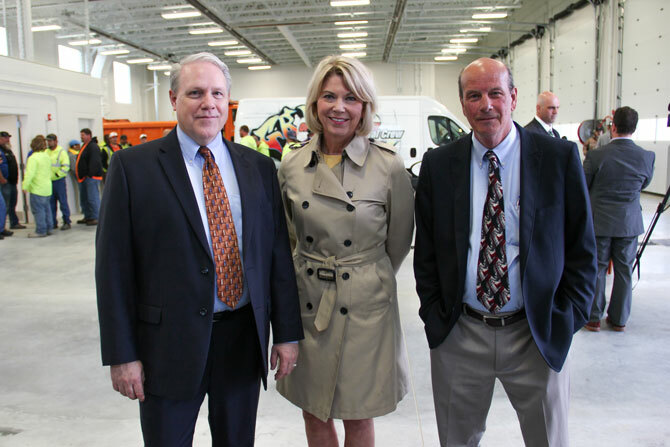 Mayor Jean Stothert, City Council President Ben Gray and street maintenance engineer Austin Rowser spoke at the event. Rowser called it a “state-of-the-art facility," which includes an almost 20,000 SF garage housing equipment, vehicles and office space; a 16,000 SF materials building and a 1,000 SF brine-mixing facility. City maintenance employees, the anti-graffiti team and a satellite division of sewer maintenance will work out of this maintenance yard. To read more, visit Omaha.com.